Well, this drunk prank features the usual cosmetic "pass out and I'll mark your face" make-up, but what makes it hilarious is the pranksters actually animate the face in a "Weekend at Bernie's" style. 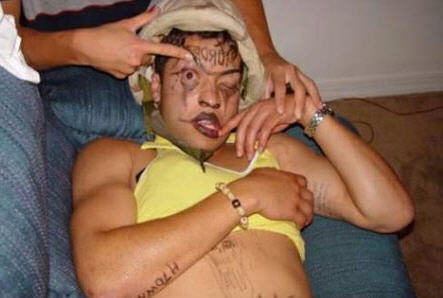 There seems to be an endless amount of idiots who drink too much and leave themselves in the hands of their buddies. Once I've collected enough of these drunk pranks I'll set up some sort of poll to get an idea of what's the most popular.